The number of pets housed at animal shelters or abandoned over Christmas and the new year has risen sharply, according to UK animal charities. Battersea Dogs and Cats Home said it was unable to cope with numbers of pets arriving and, for the first time, has had to create a waiting list. Charities have said the recession and cold weather are partly to blame. They expect to see more animals being abandoned in the coming months as pets bought for Christmas become expensive. Scott Craddock of Battersea Dogs and Cats home, which has been taking in unwanted animals for some 150 years, said: "This is the first time that we have actually put a waiting list in place for local authorities. "In the past we would probably have been able to take those dogs off their hands but now we are so full that we are having to actually ask them to hold those dogs locally before they can come into the home. So we are seeing a big increase here." He said there was room for 600 dogs and 200 cats but a "surge in new arrivals" and the fact that they have re-housed "far fewer animals than normal" so far this month meant demand for space had become acute. The cold weather is also thought to have played a part by making it harder to re-house animals. Two years ago the law changed so local authorities, rather than the police, had to take responsibility for strays. 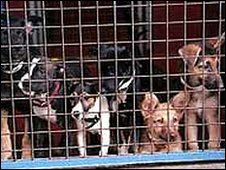 Councils keep abandoned pets in animal welfare centres which are designed to keep animals for a short time. Kay Foley, of Lewisham Council, described the local authority's experience of looking after abandoned animals. She cited the recession as a factor which had an impact, but also pointed to certain types of dog. "We are seeing more and more bull breeds coming in - they are quite boisterous. People are not getting them trained," said Ms Foley, who added that many owners were "taking the easy option" and abandoning the dogs.